Computer giant Intel , who have reported a loss in sales of personal computers this year, announce their restructuring of employment . They plan on reducing jobs by over 12,000. It employs over 5,200 people in Ireland but job losses across Europe have not been specified yet. Will corporation tax play its part in keeping Intel in Ireland? Are the skill’s and expertise of our workforce an incentive to save the Irish jobs? Microsoft has named 22-year company veteran Satya Nadella as its next chief executive officer, while also announcing that co-founder Bill Gates would step down as chairman and advise the new CEO on technology. The moves mark an epochal change of control at the company that drove the PC revolution. 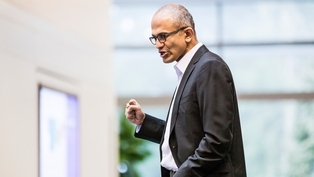 Mr Nadella, a 46-year old born in India who led the creation of Microsoft’s cloud computing services, is only Microsoft’s third CEO in 39 years, taking over from Steve Ballmer, who inherited the job from Mr Gates in 2000. The move ends a five-month search process at the Redmond, Washington-based company, triggered by the August announcement of Mr Ballmer’s decision to retire.